Spend two weeks amongst the beautiful landscapes of ancient Lycia. Canoe from the ancient city of Xanthos, discover hidden beaches along the coastline, sea kayak over sunken ruins and explore ancient villages in the Taurus Mountains. The first week is based in the harbour town of Kas with its cobbled streets and street cafe culture followed by a week sailing along the coast on a traditional gullet. Today the Legends of Lycia trip ends and we transfer to Fethiye to join the gulet for our Blue Cruise. This trip starts at Fethiye harbour where we board our gulet and meet the crew. Fethiye is a market town that can trace its history back to the ancient Lycian city of Telmessos built around the harbour in the 5th or 6th Century B.C. Reminders of the town's past include Lycian rock tombs on the hillside and a Hellenistic theatre. We spend our first night in the harbour. After a short transfer to the sleepy village of Dalyan we board our riverboat. We first head upriver to the therapeutic mudbaths of Ilica - a chance to unwind fully in preparation for the week ahead! - and then meander downstream, weaving through reed beds rich in bird life. We pass cliffs carved with dramatic Necropolis tombs before coming to the ruins of the ancient seaport of Caunus. Much of the site is overgrown, but the fine Hellenistic theatre is well preserved and the views from the fortified acropolis are breathtaking. Looking south to the Aegean 5 kms away it is hard to imagine that Caunus was once a thriving port, but fell into decline when the harbour silted up. Continuing by riverboat we reach Iztuzu Beach, a wide spit of white sand lapped on one side by the Aegean and on the other side by the fresh waters of the Koycegiz River. This is one of the few remaining nesting places of Caretta caretta, the loggerhead turtle. Development at Iztuzu has been banned and an overnight curfew is placed on the beach, as this is when the female turtles come ashore to lay their eggs. Having paused to swim we transfer back to Gocek and board our gulet. We enjoy lunch aboard whilst sailing south to our first overnight mooring at the tranquil cove at Yassica Island. After a optional walk on Yassica Island we make the short crossing to Tersane Island. Formerly the site of a prosperous Greek village, Tersane is now deserted. Among the remains are a watchtower and some tombs, all of which are now ruined but well preserved. From here we continue to Batik Hammam where we will have the opportunity to swim in the beautiful clear waters. We finish our day heading towards our next night stop at Gemiler Island. 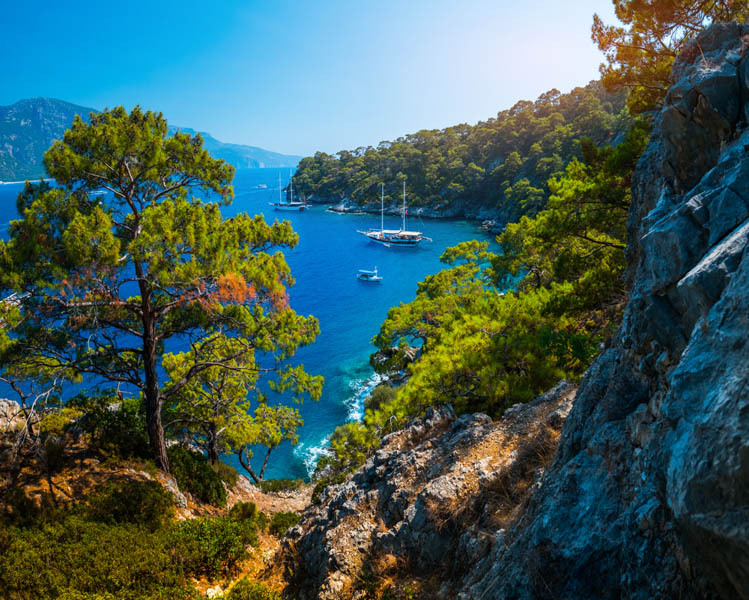 We make an early start to sail to Kalkan, an attractive village built into the steep seacliff. Kalkan is an ideal base from which to visit the ancient city of Xanthos as well as Saklikent Gorge which is a short drive away. Xanthos was the capital of ancient Lycia, captured by Brutus in 43BC, but only after the menfolk had killed all their women and children to save them from falling into Roman hands. Saklikent Gorge, which means Hidden Place, is situated high in the mountains above Fethiye was created by icy cold water cutting through the mountains over thousands of years. A natural wonder, the resulting canyon is 300 metres deep and 18 km long. The walls are so high they cut out most of the sunlight and the fresh spring waters that flow through are freezing cold! A great refuge on a hot summer day. After sailing one of the loveliest stretches of coastline from Kalkan eastwards to the sheltered bay of Kekova, we drop anchor and once again have the chance to venture onshore to discover the ancient heritage of the Lycian Coast. This morning there is the chance to sea-kayaking again in the calm, protected waters of the bay of Kekova. Here we find the so called Sunken City of Kekova: partly submerged streets and buildings are visible in the crystal clear waters. Later we paddle to the picturesque whitewashed village of Simena, whose harbour is dotted with ancient sarcophagi (tombs) and whose houses cling to a hillside beneath a medieval castle. Hiking up to the castle we find within its walls a tiny ancient theatre, carved from the solid rock, a wonderful place to sit and soak up the beautiful surroundings and layers of history all about. In the afternoon we make our final gulet journey, sailing west to the pleasant little harbour town of Kas. This attractive port is one of the most beautiful of the Turkish Riviera, backed by steep cliffs covered with dense green forest. You'll have time to enjoy the atmosphere at one of the many lively cafes near the harbour. 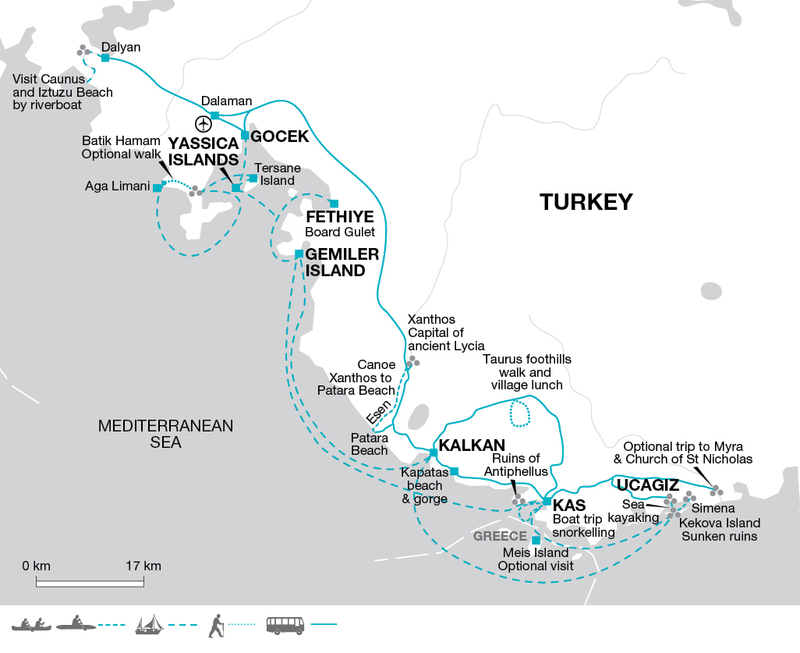 Today we take a leisurely pace, returning westwards towards Fethiye. Stopping en route for swimming opportunities, we eventually moor up around 1 hour from Fethiye in a quiet bay. This morning we sail back to Fethiye where the trip ends. Turkey family holiday: Combining a week sailing in the warm waters of the Mediterranean with an active, fun week based in seaside town of Kas this two week family holiday to Turkey is an ideal combination of relaxation, lots of swimming opportunities and varied activities to keep the whole family entertained. Hotel and Boat information: Our base for the first week is the Club Phellos Hotel located a short walking distance from the harbour with great views out to the ocean. The hotel features a large outdoor pool complete with a 40 meter water slide; snack bar and extensive breakfast terrace. The traditional gulet, our home for the second week, is hand built in teak and pine, with a spacious and partly shaded foredeck and comfortable indoor and outdoor lounge areas. Meals are prepared on board by the boat chef and enjoyed in the shaded aft deck. There are four twin and four double cabins, all with an en suite bathrooms and plugs to charge mobile devices and cameras. Triple Rooms: This trip allows the option for triple rooms to be included for the first week of the holiday in Kas, there are no triple cabins on board the gulet boat. If you would like to reserve a triple room for the first week please ask our Sales team for further information. This holiday allows you the opportunity to explore the region with visits to local villages as well as enjoying a number of arranged activities including; sea kayaking, canoeing and a boat trip. 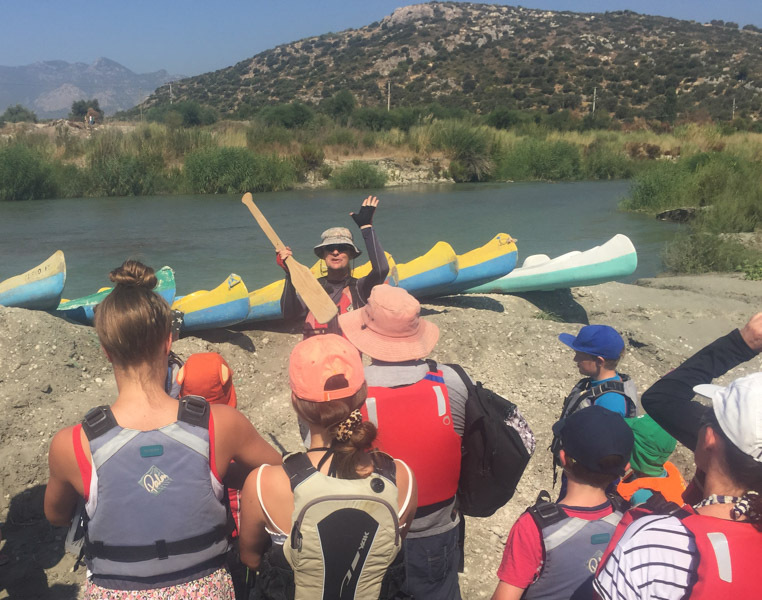 Turkey is great value at the moment, you can take your family on an active adventure to an interesting country which also offers time sailing along the Turkish coast in the Meditarrean with stops off at historic ruins and the option to kayak, and walk amongst the history of the country. Our vessel is the gulet boat, a traditional Turkish boat that now cruises along the coastal treats of this great country.